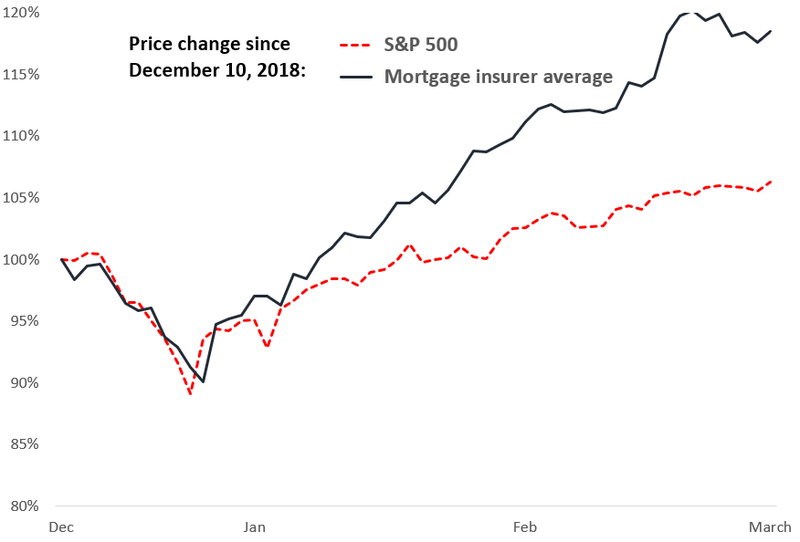 The mortgage insurance (MI) company stock valuations remain very low, presumably because Mister Market fears a sharp rise in mortgage defaults. Mister Market is seriously wrong. I present 5 pieces of evidence. 2019 should be the year when the MIs start paying investors in a big way, through dividends and especially stock buybacks. Despite their rally since mid-December, I expect the MI stocks to have a 50% upside over the next few years. The low valuations tell us that Mister Market’s story about the MIs is their EPS is certain to head down materially in the not-to-distant future. 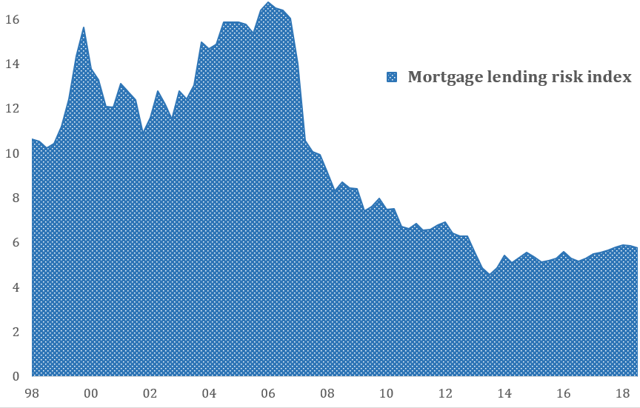 The reasoning has to be that a weak housing market will lead to materially rising mortgage default claims. After all, we are ten years into an economic expansion, and lenders have always done stupid things by then. And the last time they did something stupid with mortgage lending, they outdid themselves with a spectacular blow-up. So we investors should be shaking in our boots about the MIs, right? Wrong. The real story is that the MIs today have many very real defenses against rising defaults, and that shareholders should start benefitting in a major way from the good defensive work. The MIs’ tight defense – an argument in five pictures. 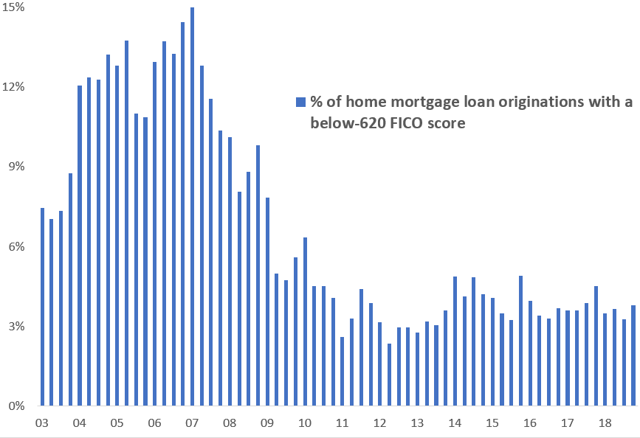 My prior MI posts presented lots of data supporting the safety of mortgage credit overall, and of the MIs’ insured mortgage portfolios in particular. Here’s a couple of pictures that update the data or add new angles. Not only is housing not in excess in the U.S., we have a growing shortage. 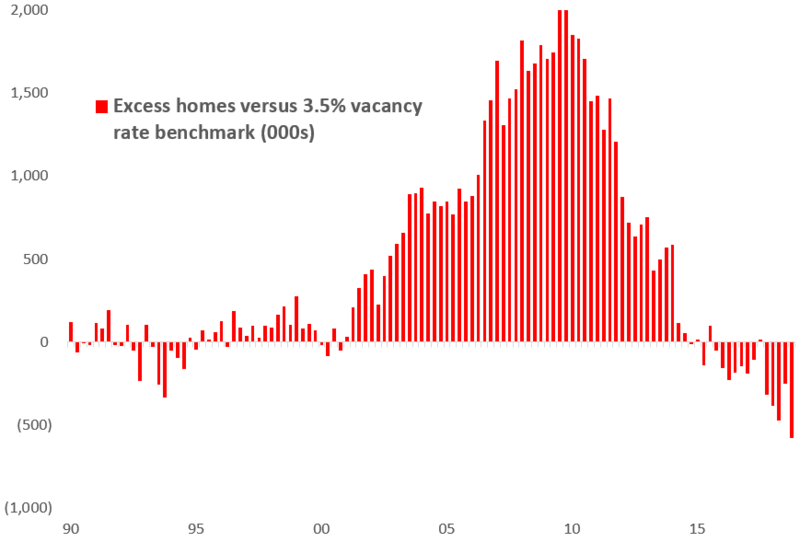 That makes sense when you combine the recent news of healthy job growth and soft home construction. Prices of any product don’t decline when there is a shortage of it. MGIC and Radian are seeing losses plummet from their insurance they issued during the housing bubble. Essent and NMI, who both started up after the bubble, have essentially no claims payments. Not exactly signs of imminent danger. So why worry? Ignore Mister Market. The MIs’ improving offense – returns to shareholders. · Their underlying product, mortgage debt, is not a growth product. 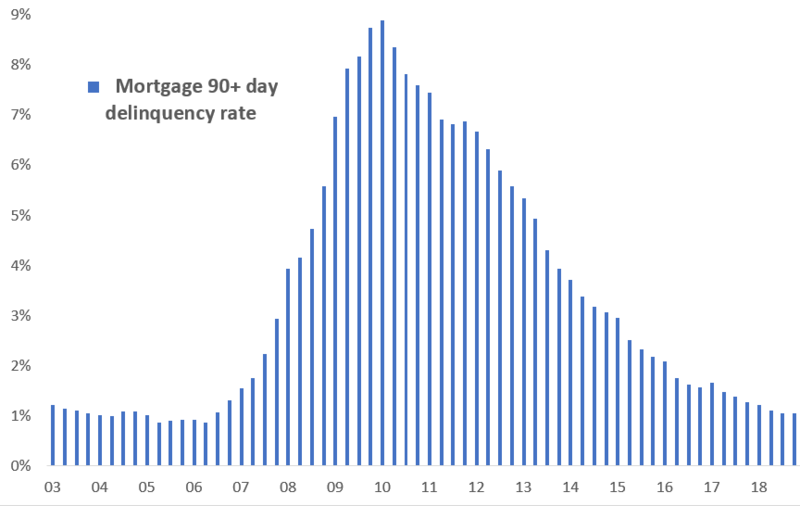 Mortgage debt growth is quite sluggish, at less than 3% annually over the past three years. Mortgage debt should grow no faster than household incomes over the long term, which is about at a 3-4% pace. · The MIs have no natural product extensions. They all offer some mortgage origination services to their mortgage banking customers, but these extras will always represent less than 10% of profits. · I can’t see the MIs diversifying. They will not build out 5G networks. They won’t produce original content for streaming companies. They will not sell artisanal toothbrushes online. They are far more likely to be acquired to help diversify some other company. Listening, Warren Buffet? No, we will have to be satisfied with bond-like returns with a modest growth kicker. That isn’t so bad when, as I showed above, the bonds are earning 12% returns. But one problem – the MIs are more like zero coupon bonds today. They haven’t been paying much at all to investors, either through dividends or share buybacks. The MIs’ recently introduced capital requirements have the acronym PMIERS. All of them have a healthy cushion to their requirements, and are expected to earn material sums in 2019. Note also that the pre-2009 legacy insurance held by MGIC and Radian require a lot of capital versus their new competitors Essent and NMI, so as their legacy books pay down, MGIC and Radian will free up a lot of capital. Further, the MIs are have selling off some of their credit risk through various reinsurance arrangements, which frees up more capital. · MGICwill aggressively buy back stock this year; my guess is at least 5% of its outstanding shares. And it should institute a dividend. · Radian should buy back 3%+ and could raise its currently token dividend. · Essent should be in the position to announce a buyback program and/or dividend. · NMI could fund its still-rapid insurance in force growth without another dilutive share offering. And 2020? The cash flow offensive should increase further. Get ready to reap your cash rewards, MI investors. I believe the MI stocks still have a comfortable 50% upside over the next few years. Disclosure: I am/we are long NMIH. I wrote this article myself, and it expresses my own opinions. I am not receiving compensation for it (other than from Seeking Alpha). I have no business relationship with any company whose stock is mentioned in this article.